Shares of the meal-kit service fell after another disappointing earnings report. Shares of Blue Apron (NYSE:APRN) took a dive last month, after the company issued another underwhelming earnings report and worries continued to mount about the meal-kit provider's long-term viability. According to data from S&P Global Market Intelligence, the stock finished the month down 18%. The company is still losing money, and revenue is falling rapidly. Coming into November, the stock got a brief boost on a partnership with Walmart's Jet.com. However, that quickly gave way to concerns about its upcoming earnings report. The stock slumped ahead of the third-quarter results, fell on the day the results came out, and continued to slide from there. Blue Apron's third-quarter earnings report presented more of the same problems for investors. Revenue fell 28% to $150.6 million, badly missing estimates at $160.3 million, as the company deliberately cut back on marketing to focus on operational improvements and moving toward profitability. Customer count was also down 25% fell from 856,000 to 646,000, and average revenue per customer slipped from $245 to $233. On the cost side of the ledger, Blue Apron did show some improvements, with the cost of goods sold falling from 78.1% of revenue to 68%, and it also cut marketing and general and administrative expenses significantly. 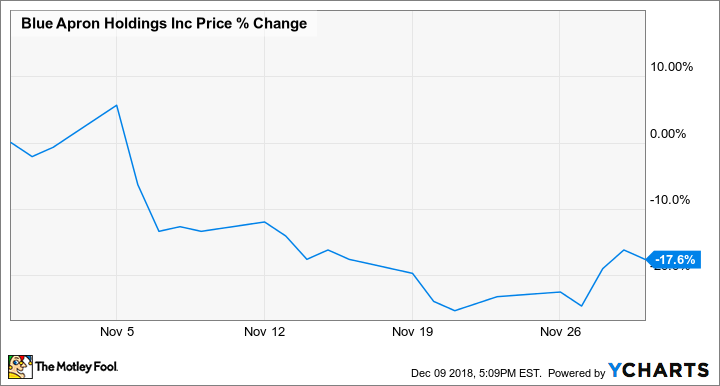 As a result, its net loss narrowed from $87.2 million to $33.9 million, or -$0.47 to -$0.18 on a per share basis, which beat expectations of a $0.22-per-share loss. Separately, the company said it will lay off 4% of its workforce and make other strategic changes, including focusing on its best customers, which it said would deliver positive adjusted EBITDA this year. "As we look ahead, we are confident in our disciplined approach to pursue initiatives that will enable us to realize the results we expect, with a deliberate emphasis on reaching profitability on an adjusted EBITDA basis next year," CEO Brad Dickerson said. While Blue Apron is making steps toward profitability, the sharp decline in revenue signals an underlying weakness in the business, especially as the company said revenue would decline by a similar rate in the fourth quarter. Looking ahead to 2019, management said it expected lower full-year revenue due to losing "unproductive" revenue, or revenue from unprofitable customers. Blue Apron shares are now down nearly 90% from their IPO at $10 last June, trading just north of $1. If there's any good news for investors, it's that the stock is so cheap that if the company is able to deliver a bottom-line profit, shares will surely move higher. But that's far form guaranteed at this point.